While Hollywood still tries to bask in the glow of overstuffed summer blockbusters such as 'Solo' and 'Deadpool 2,' a pair of more modest films arrive today in local theaters. Ironically, both are true stories featuring fascinatingly dissimilar riding vessels: horses in one and a sailboat in the other. Brady Jandreau is the man with the horse in "The Rider." 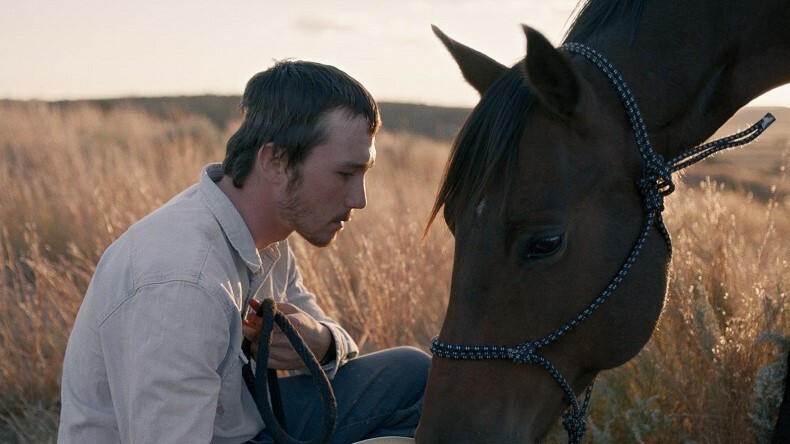 "The Rider," which picked up five Independent Spirit Award nominations last year well before its 2018 release, tells the tale of young Brady Jandreau, the legitimate South Dakota rodeo standout, playing himself (albeit with a character surname of Blackburn) and painfully recovering from serious injuries that likely took his career, almost his life, but certainly not his soul. The unexpected result of this often majestic film, as keenly written/directed by Chloe Zhao (which earned her the ISA Bonnie Award), is the likelihood of Jandreau actually becoming a movie star. I mean, he's certainly the magnetic center in a cast of non-actors (including his dad Tim and sister Lily), not to mention a performance that might remind some of Robert Redford in "The Horse Whisperer" and definitely offers the quiet grit of the late James Dean in just about anything. It's also an extremely good-looking effort, with cinematographer Joshua James Edwards returning to the same soaring visual realities of the Pine Ridge Indian Reservation landscapes shown off in Zhao's debut feature, "Songs My Brothers Taught Me." Meanwhile, the lesser "Adrift," based on a real adventure of survival on the high seas, probably should have been more harrowing than it is in the hands of Baltasar Kormakur, an Icelandic director of some note after helming "The Deep," a similarly themed thriller; "2 Guns," and "Everest." Woodley and Claflin find themselves "Adrift." Alas, we get more lovey-dovey romance -- in too many silly flashbacks -- than thrills in this fact-based story of a couple that quickly falls in love before earning big money to man the aforementioned sailboat from Tahiti to San Diego. Obviously, nothing funny happens on their way to what was supposed to be a 4,000-mile picnic, either, just too many huge closeups of Shailene Woodley and Sam Claflin, as the happy twosome (at least for a while). I'm tempted to call the whole ill-fated affair drippy, but you'd swear I was trying to make a fun pun about what allegedly actually occurred. Also opening is a sci-fi, blood-fueled fest called "Upgrade," one of 10 buzz worthy films we listed as ones to seek out in our summer movie preview back in April. Regardless, BH Tilt distributors did not see fit to extend us an invitation to a Cleveland screening, so we'll never know if the hype is or was legit. Until recently, John M. Urbancich, former and first Executive Editor of CriticsChoiceMovies, reviewed films and wrote related features and celebrity profiles at Cleveland's Sun Newspapers since 1983. As a longtime member of the Broadcast Film Critics Association, John's work also appeared on the Sun News website (now cleveland.com) for three decades. Read more about John's career at Sun here. Michael Jackson meets St. Peter in "They Don't Know Jack," a short film written, directed and produced by John. Click here to watch now. John M. Urbancich is a "Tomatometer-approved" critic on Rotten Tomatoes. Look for RT links to reviews and quotes here. READ JOHN'S LATEST Toronto International Film Festival REPORT AT WKYC.COM. RECENT REVIEWS: "Disneynature: Penguins"; "Shazam!" and "Pet Sematary"; "For Now"; "Us," "Hotel Mumbai," and "Gloria Bell"; "Captain Marvel"; "Fighting with My Family"; "Isn't It Romantic," "Capernaum"; "Hummus! The Movie"; "What Men Want"; "A Boy Called Sailboat"; "Stan & Ollie"; "Glass"; "Mary Poppins Returns," "Mary Queen of Scots," "Ben is Back," "Bird Box," "Aquaman"; "The American Meme"; "Green Book," "Ralph Breaks the Internet," "Creed II," and "The Front Runner"; Widows," "Wildlife," "Boy Erased," "The Ballad of Buster Scruggs," and "Fantastic Beasts: The Crimes of Grindelwald"; "Overlord," "The Grinch," "The Girl in the Spider's Nest," "Can You Ever Forgive Me?" and "What They Had"; "Bohemian Rhapsody," "Beautiful Boy," "Suspiria," "The Happy Prince," and "The Other Side of the Wind," "Ophelia"; "Halloween"; "First Man," The Hate U Give," The Old Man & the Gun," and "Bad Times at the El Royale"; "A Star Is Born" and "Venom"; "The Happytime Murders"; "Scotty and the Secret History of Hollywood," "McQueen," and "Mile 22": "Eighth Grade" and "Mission: Impossible -- Fallout"; "The Equalizer 2"; "Leave No Trace", "Sorry to Bother You," and "Skyscraper"; "Ant-Man and the Wasp," "Whitney," and "Boundaries": "Sicario: Day of the Soldado"; "Won't You Be My Neighbor? "; "Superfly"; "First Reformed" and "Hereditary"; "The Rider" and "Adrift"; "Deadpool 2," "Book Club," "Disobedience" and "Pope Francis: A Man and His Word"; "Borg vs. McEnroe"; "Beirut"; "Blockers," "Chappaquiddick," "Isle of Dogs," "The Leisure Seeker," "The Miracle Season," and "A Quiet Place"; "Ready Player One"; "Unsane, "Pacific Rim Uprising," and "Sherlock Gnomes"; "Love, Simon," "Tomb Raider," and "7 Days in Entebbe"; "Annihilation"; "Black Panther"; "Film Stars Don't Die in Liverpool": and "Double Lover"; "Star Wars: The Last Jedi"; The Shape of Water"; "Ferdinand"; and Wonder Wheel"; "Three Billboards Outside Ebbing, Missouri," "Coco," "Roman J. Israel, Esq." "Last Flag Flying, and "Novitiate"
Movie Review Archive -- "Borg vs. McEnroe"; "Beirut" (April 10); April 6 openings; "Ready Player One" (March 29); March 23 openings; March 16 openings; "Annihilation" (Feb. 22); Feb, 16, 2018, openings; Dec. 15 openings; Thanksgiving openings: Nov. 17 openings; "Lady Bird" (Nov. 16); Nov. 10 openings; Nov. 3 openings; Oct. 27 openings; Oct. 20 openings; "Blade Runner 2049" (Oct. 5); "The Only Living Boy in New York" (Aug. 25); Aug. 18 releases; Aug, 11 openings; "A Ghost Story" (July 27); First batch of films for TIFF 2017 (July 25); "Dunkirk" (July 20); July 7 releases; "Baby Driver" (June 27); June 23 openings; "The Book of Henry" (June 15); June 9 openings; June 2 openings; May 26 openings; May 19 openings; "Guardians of the Galaxy Vol. 2" (May 4); "My Entire High School Sinking into the Sea" (April 27); April 21 openings; April 7 openings; March 31 openings; "Life" (March 24); "Kong: Skull Island" (March 10); March 3 openings; Feb. 23 openings; "The Lego Batman Movie" (Feb. 9); Feb. 3 openings; Jan. 20, 2017 openings; "Manchester by the Sea" (Dec. 8); "The Eagle Huntress" and "Man Down" (Dec, 2); Thanksgiving Day capsules (Nov. 22), November capsule reviews (Nov. 17); Early fall capsule reviews (Oct. 15); "Sully" (Sept. 8); "Don't Breathe" and "Hands of Stone" (Aug. 25); "Anthropoid," Florence Foster Jenkins," "Pete's Dragon," "Sausage Party" (Aug. 11); "Suicide Squad" (Aug. 4); "The Legend of Tarzan" (June 29), "Finding Dory" (June 16), "The Conjuring 2" (June 9), "X-Men: The Apocalypse" (May 25), "The Nice Guys" (May 19), "Money Monster" (May 12); "Captain America: Civil War" (May 5); "Everybody Wants Some!! ", "Elvis & Nixon," "Miles Ahead" (April 21); "The Jungle Book" (April 14); "The Boss" (April 7); "Eye in the Sky" (March 30); "Triple 9" (Feb. 25), "Touched with Fire," "Race," "The Witch" (Feb. 18. 2016); Christmas wrap-up: "The Big Short," "Youth," "Carol," "The Hateful Eight," "Concussion," "Joy" (Dec. 23); "Star Wars: The Force Awakens" (Dec. 16), "Brooklyn," "The Danish Girl," "The Good Dinosaur" (Nov. 24), "Spotlight" (Nov. 19), "Room" (Nov. 12); "Suffragette," "Spectre," "The Peanuts Movie," "Victoria," "Miss You Already," "I Smile Back" (all Nov. 5); "Bridge of Spies" (Oct. 16); "Goosebumps" (Oct. 15); "The Walk" (Sept. 30); "Southpaw" (July 23); "Amy" (July 10); "Me and Earl and the Dying Girl" (July 1); "Good Kill" (May 21); "True Story" (April 19); Oscar picks (Feb .19, 2015); 2014 wrap-up (Dec. 30), "Dumb and Dumber To" (Nov. 13), "Whiplash" (Nov. 6), "Birdman" and "Nightcrawler" (Oct. 30), "Dear White People and St. Vincent" (Oct. 23), "Gone Girl" (Oct. 2), "The Boxtrolls" (Sept. 25, 2014). Rating system: $$$$$ -- A bargain at any price; $$$$ -- Worth the price of admission: $$$ -- See it at a bargain matinee; $$ -- If you must, wait for cable; $ -- They should pay you. You also can check out what John says earlier at JetSetJen, "Luxe Living for the Jet Set Jen-eration." Go straight to arts/movies here for latest reviews: ("Bright Star," "Thirst," "The Informant!" "My One and Only," "Management," "Ponyo," "Paper Heart," "Flame & Citron," "Whiteout"), and parties for Mel and "The Miz."